There are Original Equipment Manufacturers (OEMs) across many industries who build products that use small control systems with traditional, simple hardwired controls such as cube relays, timers and counters. 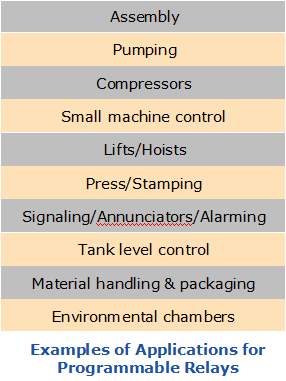 These small control systems are commonly found on assembly equipment, conveyors, machine tools, presses and pumping equipment used for both commercial and consumer applications such as industrial manufacturing, HVAC equipment, door/gate controls, commercial appliances, vending machines and amusement equipment. OEMs in all business sectors continue to struggle justifying the use of legacy control designs to meet current and future business objectives. 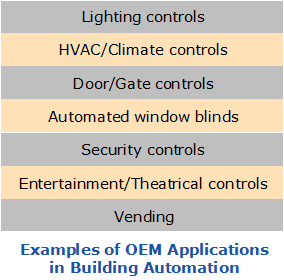 Today, many of these OEMs are migrating their traditional hardwired control designs toward alternative control systems. In fact, for most OEMs, programmable relays can serve as a very cost effective controller for their products due to not only their increased flexibility and reduced physical size, but also because they offer a lower total cost solution with quicker assembly and installation compared to hardwired controls. Programmable relays are microprocessor-based controllers that have similar capabilities to a PLC (Programmable Logic Controller) with built-in timers, counters and compare instructions, but can be programmed more easily like wiring simple hardwired controls. In the past, OEMs were forced to choose between simple hardwired controls or internally developed and designed custom controllers for their products. 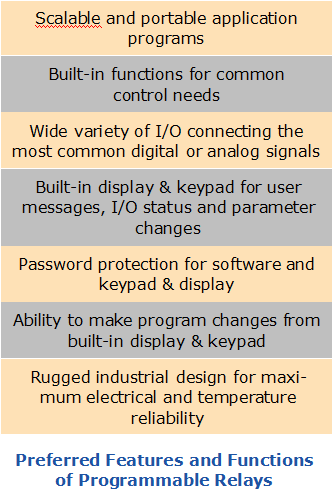 In either case, very small systems often could not justify the cost of a PLC, or similar controller, until the programmable relay became available. Programmable relays are used in many industries and are now being used in new applications that previously were cost, technology or size prohibited. For example, programmable relays are replacing hardwired timers, counters and cube relays in applications ranging from ventilator controls in office buildings to sequential control systems for industrial manufacturing. Additionally, programmable relays are now penetrating a wider variety of non-manufacturing or commercial OEM applications as OEMs become more aware of the importance of the total cost of their products. The basic design of a programmable relay integrates common control functions as built-in features to eliminate the purchase of separate control devices. Multiple timers, counters and cube relays can be replaced with a single programmable relay, greatly reducing the number of required components. This helps OEMs control costs and minimize component inventory levels and purchasing overhead. The size of an enclosure required for multiple hardwired devices is much larger than that of a single programmable relay. The compact mechanical footprint of a programmable relay, with standard DIN rail or panel mounting clip options, significantly reduces the required electrical enclosure size. The size of an enclosure not only affects the individual enclosure cost, but more importantly the size of the machine and location to mount the enclosure. The programmable relay, as a single integrated and configurable device, greatly improves the OEM’s process of design and configuration. Easy to understand drawings can be developed quickly using provided CAD tem- plates from the programmable relay suppliers. Simple programming commands based on hardwired principles make configuring a programmable relay easy and eliminate the need for an engineer or trained programmer to configure it. Assembly and testing of a system with hardwired controls requires a significant amount of interconnect wiring between individual devices, increasing material costs such as wire, terminal blocks, wire duct, DIN rail, etc., and labor costs. Installing and wiring a single programmable relay with a built-in power supply and screw terminals greatly reduces wiring time and testing with fewer connections and fewer possible points of failure. A control system based on programmable relays helps an OEM reduce the amount of time for commissioning and maintenance. An integrated display and keypad on a programmable relay provides alarm messages and I/O status for easy troubleshooting, often eliminating the need for a multi-meter or logic probe, which is used to maintain hardwired controls. Customizing a programmable relay system to meet changing customer needs only requires programming changes without additional devices. Total cost in any control system has a mix of fixed costs and variable costs. Simple hardwired controls such as start/stop inputs, run lights, timers or counters, and loads may have lower fixed product costs in a very small sys- tem, but in larger systems the fixed component costs, interconnect wiring costs and electrical enclosure costs increase significantly. Programmable relays may have a slightly larger initial capital investment for a programming cable etc, but it greatly reduces the cost of wiring and the enclosure size when compared to simple hardwired controls. A simple hardwired control design requires a prototype capital investment, as well as some additional costs for design and development. This is be- cause of the amount of schematic engineering for interconnecting wiring, along with additional design engineering to validate compatibility between the individual devices. In a comparable programmable relay system, the capital investment for developing hardware and software is slightly more, but significant savings are seen in the engineering effort, estimated at near- ly a 35 percent savings over hardwired controls. The only engineering required on a programmable relay system is writing the application pro- gram. No hardware engineering needs to be performed by the OEM on the internal components such as timers, counters, contacts, and coils when us- ing a programmable relay system. Depending upon the complexity and quality of the control system design, an OEM may dedicate 7-10 percent of their resources to support tasks. These costs may increase if a hardwired component becomes obsolete, or if customers have special I/O requirements and re-engineering of a simple control system is required. With an equivalent programmable relay system, re-engineering and internal support only requires a programming change, or the addition of an expansion I/O module. Broader application span: Extensive flexibility and simple programming language standards allow programmable relays to meet a wide variety of OEM product requirements. Easy re-use of software: The scalability of programmable relays and their common programming software can be easily re-used and reloaded to accommodate the changing needs of the users of the OEM products. Low implementation cost: Built-in common control functions such as timers, counters, real-time clocks, high- speed counters, temperature controls, etc. provide the capability of solving complex tasks with minimal programming. Built to Industrial Standards: Programmable relays are designed to operate in harsh industrial manufacturing environments, which provides manufacturing grade reliability for any non-manufacturing application at no additional cost. Use of programmable relays in the OEM market is growing rapidly. Over the past several years, OEMs have begun embracing programmable relays in a variety of applications as they continue to face challenges that require lower costs, greater functionality, and smaller product sizes, which has expanded the role of programmable relays beyond traditional markets. On-time delivery of their equipment to the market is extremely critical to OEMs today. Any delay can result in lost sales. The environment of continuously changing demands from customers frequently translates into shorter product lifecycles for OEM products, which is why some early adopter OEMs now have begun to look into commercially available programmable relays instead of hardwired controls or a custom control board. These OEMs are able to use programmable relays to enable faster time to market and quicker updates of their existing products to meet customer demands. The resulting use of programmable relays increases the agility and flexibility of OEM products and reduces life cycle costs. text messages and I/O status. variety of important information. When programming the device through the front panel, the display shows the connected function blocks or ladder logic rungs. When in operating mode, the display can show text messages, the status of inputs and outputs, and variable and current values, as well as time and date information. The display can also show the parameter values being changing from the front panel such as timer and counter set points, PI control parameters for temperature applications, etc. Rich functionality, ease of use and the compact size of modern programmable relays is beneficial to OEMs. It is expected that an increasing number of OEMs will begin using programmable relay solutions in their products to reduce overall costs, speed up time to market and provide product performance improvements. lower product costs, reduce operating costs and increase return on investment (ROI) to remain competitive in the global market. This is expected to result in the increased use of programmable relays in place of hardwired controls and custom boards across many industries. system with hardwired controls must be weighed against its goal of lowering total costs while fulfilling business objectives to quickly produce product variants to meet changing market demands. • OEM engineering should focus on investing in core product competencies rather than distracting its efforts to maintain a custom hardwired controls system design for which effective packaged solutions such as programmable relays are available.